Motorway (Inntal Autobahn A12) Exit Hall-Mitte. Follow the road straight on for about 830m to the road 'Glockenhofstrasse', drive along this road for about 2 km until you get the road 'Mittelgebirgsstrasse'. Follow the road towards 'Schmalzgasse' for about 2,5 km. After 488m turn left to the Glugezerstasse, follow the road for 723m towards Tulferberg. You'll be able to see our Guesthouse from that small road and find us easily. Actual driving time from the motorway about 15 minutes. 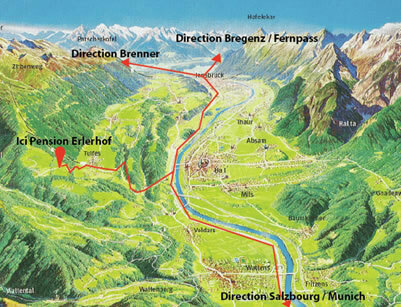 Then take the local bus or a taxi to Tulferberg. Then take the bus or a taxi to Tulferberg.